The American Antiquarian Society is this nation's chief repository for early American newspapers, and a significant portion of research done at the Society draws upon the Society's collection. The primary goal for the collection is to acquire, preserve, and make available for research newspapers published in the eighteenth and nineteenth centuries in the United States, Canada, and the West Indies. To this end, the Society adds, through gift and purchase, an average of 15,000 issues a year to its holdings. Building on Isaiah Thomas's gift in 1812 of 382 titles in 551 volumes, the Society has accumulated over 18,000 newspaper titles. Today, AAS has more than two million issues on five miles of shelving. The collection is preserved in protective folders and boxes in a climate- controlled environment. In 1973, to assure the preservation and usefulness of its newspaper holdings, the Society established the position of curator of newspapers and periodicals. The collection contains newspapers from all fifty states and the District of Columbia, the Canadian provinces, the West Indies, and Great Britain. British newspapers are retained through the Revolutionary War period. 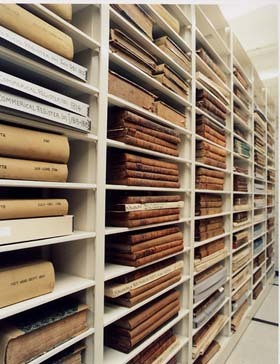 The collection is housed on-site and advanced notice is not required to use the newspapers. Records for the United States newspapers collection can be accessed through the General Catalog. The Clarence database provides item-level holdings information for most of the United States collection. The Caribbean holdings are currently being cataloged in the General Catalog. Canadian and British holdings are uncatalogued. The Newspaper Cataloging Manual of the Library of Congress defines a newspaper as a serial publication designed to be a primary source of written information on current events connected with public affairs, either local, national, or international, not limited to a specific subject matter. The Society, however, collects every kind of newspaper, those that fit the definition strictly, those that are really periodicals in newspaper format, such as college, literary, religious, or temperance newspapers, and those that do not seem to fit either category, including advertising, campaign, church fair, or price-current newspapers. Geographically the collection encompasses most areas on the North American continent and the nearby islands. 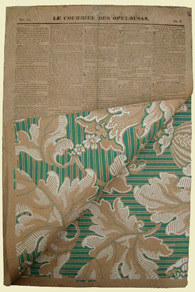 Wallpaper newspapers form an unusual group in the Society's holdings. (Le courrier des opelousas is pictured to the right.) These were newspapers printed on the obverse of wallpaper samples because of the paper shortage in the southern states during the Civil War. The Society has three copies, each on different wallpaper, of the most famous of these newspapers, the Daily Citizen from Vicksburg, Mississippi, for July 2 and 4, 1863. It holds twenty-two of the thirty-two titles listed by Clarence Brigham in his essay on the subject in Bibliographical Essays: A tribute to Wilberforce Eames (Cambridge, Mass., 1924). The newspaper collection of the Society has grown and continues to grow through purchases, particularly of pre-1821 issues and of issues from the western states for which its holdings are weak, as well as through gifts from individuals and from institutions. Many of the Louisiana newspapers came from Edward Larocque Tinker, while Waldo Lincoln brought together the West Indian issues. The Society's Rowell collection was assembled over a number of years. G.P. Rowell, noted for his annual newspaper directories, organized an exhibition of all extant newspapers in the United States for the Philadelphia Centennial Exposition in 1876. Discards from the exhibition found their way into the col- lections of the Chicago Historical Society. In 1915, that Society donated the issues from the eastern states to AAS, and in 1974 it completed the gift with all its Rowell newspapers except for those from Illinois and Indiana. After World War II, New England institutions sent hundreds of newspapers to the Society. Beginning in 1973, the Society has from time to time circulated to historical societies, public libraries, and academic institutions a request for those newspapers they could not maintain. Providing bibliographical control of and access to its research materials has been a major activity of the Society throughout its history. This has been as true for newspapers as for any other group of materials, from Thomas's catalog of his gift to the participation by AAS in the United States Newspaper Program, underwritten by the National Endowment for the Humanities. As a participant in the United States Newspaper Program, the Society entered bibliographical and holdings records for 14,000 of its pre-1877 American titles into the national database, OCLC. The lack of indexes to early American newspapers often hampers research. Brigham's Bibliography contains a title index and is complemented by Edward Connery Lathem's Chronological Tables of American Newspapers, 1690-1820, (Worcester, 1972). Avis G. Clark's typescript "An Alphabetical Index to the Titles in American Newspapers, 1821-1936" is a useful tool for nineteenth-century research. The few subject indexes to eighteenth- and nineteenth- century newspapers include Lester Cappon's Virginia Gazette Index (Williamsburg, Virginia, 1930) and the WPA index to the Hampshire Gazette of Northampton, Massachusetts (Boston, Mass., 1939). In general, newspaper indexes are genealogical in nature, such as the Index of Obituaries in Boston Newspapers, 1704-1800, compiled by the Boston Athenaeum (Boston, 1968) and the "Index to Marriages and Deaths in the Columbian Centinel," a typescript at the Society. Indexes in the Society's own collections are listed in the "Checklist of Newspaper Indexes in the American Antiquarian Society." AAS has had a partnership with Readex since 1955. This partnership has resulted in the creation of digital versions for several hundred titles available through the America's Historical Newspapers database. Although the newspaper collection of the Society is heavily used, historians and researchers have yet to realize its full potential. As Clarence Brigham noted in his Bibliography and History of American Newspapers, "If all the printed sources of history for a certain century or decade had to be destroyed to save one, that which could be chosen with the greatest value to posterity would be a file of an important newspaper." This short video features Vincent Golden, AAS Curator of Newspapers and Periodicals, who describes the history and characteristics of antebellum American newspapers. Filmed in the newspapers workroom at the Society, the video features examples of various newspapers and illustrated magazines from the Society's collection. Stanford University's Data Visualization plots over 140,000 newspapers published over three centuries in the United States.